Zucchini is one of my favorite vegetables. Light, crunchy with a delicate aroma and flavor, it works well in almost any kind of dish. I really like to have zucchini with pasta. So, when I saw a recipe for zucchini and pesto lasagna in Cuisine Gourmande magazine, I just had to try it. The lasagna came out really delicious, light, fresh, aromatic, perfect for dinner on a warm day. The recipe calls for pesto sauce, you can use either store bought pesto, or, like me, prepare it yourself (see the recipe for homemade pesto below). If the pine nuts are hard to obtain or too expensive, you can always replace them with sunflower seeds. If you decide to use dry lasagna noodles in place of fresh ones, cook them first in a slightly salted water. 1. In a large skillet heat the olive oil over medium heat. Add the zucchini and garlic and cook for about 5 min. Season with salt and pepper. 2. Place the cream into a small pot, bring to a boil, reduce heat to low; simmer 3 min. Remove from the heat, stir in pesto and half of the Parmesan cheese. Season with pepper. 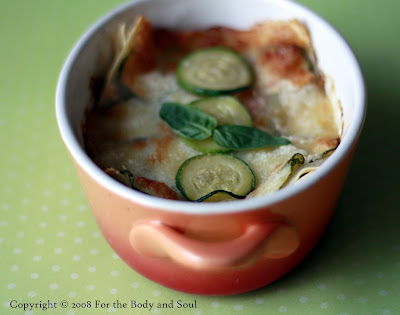 4.Spoon 1/3 of the cream, pesto and Parmesan mixture in prepared baking dish, top with three lasagna noodles, then arrange 1/3 of the zucchini slices. Repeat twice with the remaining cream, pesto and Parmesan mixture, lasagna noodles and zucchini finishing with zucchini. Top with slices of mozzarella, sprinkle with remaining Parmesan. 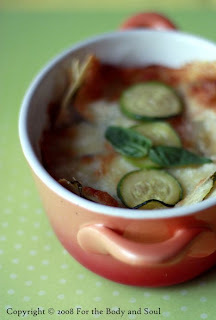 5.Bake the lasagna for about 20-30 minutes, or until the zucchini is tender and the cheese is melted. 1. Toast the pine nuts in a small pan, leave to cool. 3. Place the pine nuts, basil, garlic, and Parmesan cheese in a blender. Blend slowly pouring the olive oil. Store covered in a fridge up to five days.